Atlanta Hawks wing Thabo Sefolosha was found not guilty on three charges stemming from an April 8 incident with New York City police, an arrest that left him with a fractured right leg and ligament damage that required season-ending surgery. On Friday morning, a Manhattan jury found Sefolosha, 31, not guilty of misdemeanor obstructing government administration, disorderly conduct and resisting arrest. The charges pertained to an early-morning scene at a New York City nightclub where another NBA player, Pacers forward Chris Copeland, was stabbed. 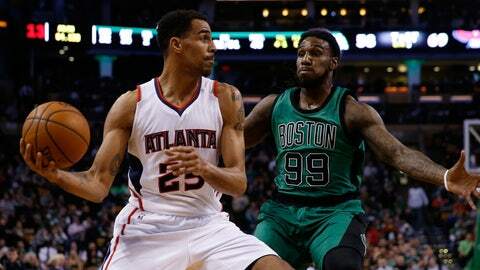 Prosecutors claimed that Sefolosha did not obey police orders in the aftermath, leading to his arrest. From the very beginning of the trial, Sefolosha has sought full exoneration — he even turned down a plea agreement last month that would have required just one day of community service and six months of good behavior. If Sefolosha plans to file a civil lawsuit in the case, this verdict will help. "This morning’s verdict ended a long and emotional period for me," Sefolosha said in a lengthy statement, in which he thanked his attorney, Alex Spiro, head coach Mike Budenholzer and the Hawks organization, the National Basketball Players Association and its executive director Michele Roberts. "Justice was served and for that I am eternally grateful to the judge and jury for their quick and deliberate decision." Sefolosha continued: "It’s troubling to me that with so much evidence in my support that this case would even be brought to trial and that I had to defend myself so hard to get justice. It pains me to think about all of the innocent people who aren’t fortunate enough to have the resources, visibility and access to quality legal counsel that I have had. Antic was also arrested in the incident, though the charges were dropped in September. Budenholzer, the reigning NBA Coach of the Year who also serves as the Hawks’ president of basketball operations, also testified on Sefolosha’s behalf, defending his player’s character. "Now I look forward to returning to the team and focusing solely on my rehabilitation for the upcoming season," Sefolosha concluded in his statement, "so that I can get back to playing the game I cherish so much."